Advantages: Informative text, plenty of previously unpublished photographs, nine pages of scale drawings, inspiring artwork. Conclusion: An important reference source that completes the documentation of this elegant 2-seater. This latest publication continues where Datafile 126 left off. That issue discussed the development of the C.XII as well as its associated Daimler Mercedes D.IVa engine. The subject was the Albatros-built versions and explanations of its history, operation, camouflage and markings were discussed. 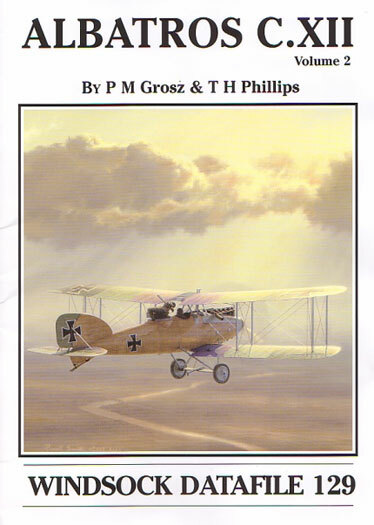 Now we delve into those machines produced by Ostdeutsche Albatros Werke (OAW) and Bayerische Flugzeug Werke (BFW). With the aid of nearly 90 photographs the authors follow the progress of these aircraft. Many are published here for the first time and will provide several surprises for the enthusiast. The accompanying captions are very informative and add greatly to the text. The data is presented in an easy to follow format and the authors do an excellent job of keeping the reader interested. Out of the 36 pages, 9 have been put aside for the general arrangement drawings. Presented in both 1:48 and 1:72 scales, these cover all aspects of the aircraft. Each of the manufacturers is covered and these are all done by the indefatigable Marty Digmayer. This time it’s the turn of Juanita Franzi to supply the artwork and she does an excellent job. Three colour profiles grace the back page, each chosen to represent different facets of the airframe. Also deserving of praise is the lovely atmospheric cover art of Russell Smith. The colours and markings worn by these machines is the specialty of Ray Rimell and he contributes with a separate section devoted to both manufacturers. Despite its elegant lines, the CX.II was not the success that Albatros hoped for. Consequently production orders were down graded when it was seen that its competitors had better performance characteristics. But with well over 400 machines delivered, the type is definitely worthy of discussion. Terry Phillips has done a wonderful job collating and presenting the information. He has carried on the work from the late Peter Grosz and given the enthusiast a great insight into this attractive aircraft.